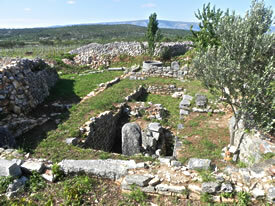 Kupinovik is the site of an ancient Roman villa rustica on the Stari Grad plain. It was a country house belonging to a Roman citizen in the first century AD, one Gaj Kornficiji Kar, a Decurion in Faria, who used to grow grapes and olives in the surrounding fields. Back then, it would have been an agricultural complex that included a fine villa with several outbuildings with wine and olive presses, mills and storage areas. At the time, it was only one of an entire community of villae rusticae all over the island. This is one of the best preserved, though clearly much of it has been recycled and rebuilt over the years. 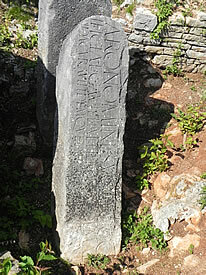 In fact, some of the massive stone supports were already recycled in Roman times so the tradition started early! You do have to be fairly determined to visit Kupinovik, as it’s a little bit tucked out of the way. It’s marked on maps that you can pick up in the tourist office of Stari Grad – for instance their walking map of archaeological sites is very helpful. The map shows Kupinovik as being next to the main Stari Grad – Jelsa road, close to the Dol turnoff. From the unpaved road you’ll come to a signpost, indicating a small footpath that gets steadily smaller and more overgrown. Stout walking shoes are an advantage at this point! Now this is actually private land, and you’ll be in the midst of someone’s olive grove by now. We asked a man busy at work in the adjacent vineyard if we were on the right path, and he turned out to be the present owner of Kupinovik, or at least the land on which it stands. Did we want to buy it? Well no, I really don’t think I want to take on a Roman villa as a project, though I have to admit to a sneaking temptation! The walls of Kupinovik are reduced to round about foundation level, with some of the old stone presses still in place. There’s been some excavation work done, and I gather some of the more valuable and/or sensitive artifacts are now to be found in the archaeological museum in Split – including the black and white mosaic floor from the villa. 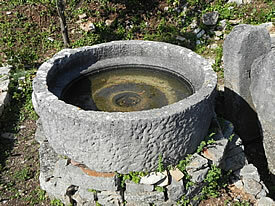 The stone olive press is still in situ and is pretty impressive – filled with rain water the day we visited. The low walls show different stages and types of building and you can guess at the way it all developed. We had the place to ourselves in May, an opportunity to sketch and enjoy the puzzle of what we were looking at. The great advantage of sketching a site like this is that you can do a David Hockney and keep moving around. (I particularly like his sequence of images that includes his feet as he moves!) The result is not a single viewpoint, but much closer to what it’s like to be there and walk around the place. 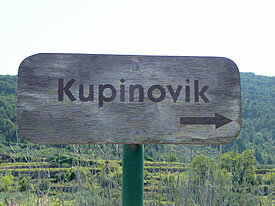 The name Kupinovik apparently comes from the wild blackberries that grow in the area. The surrounding walled fields probably don’t look a lot different now as they did then. The olive trees are grown right in amongst the walls of the site – looks like more young ones have been planted recently. There aren’t many places where you get to see the continuation of a way of life quite so evocatively.